Since the NFL's first season in 1920, the league title had been awarded to the team with the best regular season record based on winning percentage with ties excluded. Four of the first six championships were disputed, but only in 1921 did two teams ever finish tied atop the standings: the two teams disputing the title had played each other, splitting a two-game series, but league officials used a tiebreaker to controversially give the Bears (then known as the Staleys) the title over the Buffalo All-Americans. In 1932, the Spartans and the Bears tied for first place with 6–1 records. Under the rules at the time, standings were based on winning percentage with ties excluded from the calculation, meaning that the Spartans and Bears each finished the regular season with identical .857 winning percentages, ahead of the defending champion Green Bay Packers' .769 (10 wins, 3 losses) winning percentage. Had pure win-loss differential or the current (post-1972) system of counting ties as half a win, half a loss been in place in 1932, the Packers' record of 10–3–1 (.750, +7) would have won them a fourth consecutive championship, ahead of the Spartans' 6–1–4 (.727, +5) and the Bears' 6–1–6 (.692, +5). The Packers controlled their own destiny at the end of the 1932 season, but lost their final two games to the Spartans and the Bears. Further complicating matters, the Spartans and Bears had played each other twice during the regular season for 13-13 and 7-7 ties, which rendered the league's only tiebreaker useless. As such, for the first time, the league arranged for what amounted to a replay game to determine the NFL champion, but the game would be counted in the final standings, meaning the loser would drop to 6–2 (.750) and finish third behind runner-up Green Bay. The league also had to make a rule change to allow the game since championship-deciding postseason matches were banned in 1924. The game was set to be played at Wrigley Field, the Bears' home stadium, but due to severe blizzards followed by extremely cold temperatures and wind chill, the game was moved indoors to Chicago Stadium. Two years earlier, the Bears and Cardinals had played a charity exhibition game at the arena after the 1930 season, and the game was moved indoors due to extreme weather, allowing for reasonable attendance and gate revenue. The Bears won 9–7. 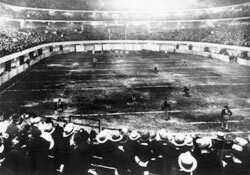 A week before the game, the concrete surface had tanbark placed atop for a Salvation Army-sponsored circus; elephant manure from the circus produced an odor that caused a Bears player to throw up on the field. The tanbark-covered field itself was only 80 yards long (60 yards between the goal lines) and 45 yards wide, 10 yards narrower than the regulation width at the time. The sidelines were butted up against the stands. The goal posts were moved from the endlines to the goal lines. Every time a team crossed the 10-yard line, the ball was moved back 20 yards to allow for the shortened field. For the first time, all plays started with the ball on or between the hash marks, which were ten yards from the sidelines. It was also decided that due to the smaller field and indoor stadium, drop kicks and field goals would not be used in the game. The high temperature for that Sunday in Chicago was 20 °F (−7 °C), warmer than anticipated earlier in the week. With terrible footing on the mulch and limited room for the offenses to work, the defenses dominated the game's first three quarters, with the game remaining scoreless. Bears quarterback John Doehling's first pass flew into the stands, as did most punts and kickoffs, with one colliding with a Chicago Black Hawks sign and another hitting the organist as he played. By the end of the game, only one punt was returned. On one drive, the Spartans were in position to score when Glenn Presnell tripped on the field before he could reach the end zone. For the Bears, they employed a heavy run game with fullback Bronko Nagurski, though possessions ended after just three downs as Ralph Jones frequently elected to pooch kick. In the fourth quarter, the Bears scored on a controversial touchdown: Carl Brumbaugh handed the ball off to Nagurski, who pulled up and threw to Red Grange in the end zone for the score. Rules at the time mandated that a forward pass had to be thrown from at least five yards behind the line of scrimmage. The Spartans argued Nagurski did not drop back five yards before passing to Grange, but the touchdown stood. The Bears later scored a safety after the Spartans fumbled the ball out of their end zone. Because it proved so popular, the 1932 NFL Playoff Game started a new era for the National Football League and for American football in general. Through 1932, the league had used the same rules as college football. Beginning with the 1933 season, the NFL introduced its own set of rules. The goal posts were moved from the end line back to the goal line (reversed in 1974), all plays started with the ball on or between the hash marks, and the forward pass became legal anywhere behind the line of scrimmage; ironically, the forward pass rule was supported by Spartans head coach George Clark, who quipped, "Nagurski would do it anyway!" NFL Commissioner Joseph Carr described the rule changes as providing better scoring opportunities, which he believed "would improve the game for both players and spectators." Carr had attended the Playoff Game, and kept a ticket stub from the game in his personal scrapbook. In 1933, the NFL expanded to ten teams and divided into two divisions. The division winners met in a scheduled championship game to determine the NFL champion. The 1932 NFL Playoff Game is also regarded as the first major indoor football game, a variation of American football with rules modified to make it suitable for play inside arenas. While several attempts to develop a true indoor football game have been made since then, the only version to meet with anything resembling true success and acceptance has been arena football. ^ "Pro standings". Milwaukee Sentinel. Associated Press. December 12, 1932. p. 11. ^ Kuechle, Oliver E. (December 13, 1932). "Pro football league will change system of rating teams in 1933". Milwaukee Journal. p. 6, part 2. ^ McGlynn, Stoney (December 12, 1932). "Bears whip Packers, 9-0, tie for pro title". Milwaukee Sentinel. p. 11. ^ Kuechle, Oliver E. (December 12, 1932). "Packers lose to Chicago Bears on snow-covered field, 9-0". Milwaukee Journal. p. 4, part 2. ^ Horrigan, Joe (1980). "CLEVELAND'S 1ST TITLE" (PDF). The Coffin Corner. Professional Football Researchers Association. Archived from the original (PDF) on November 27, 2010. Retrieved January 30, 2018. ^ Smith, Wilfrid (December 16, 1932). "Bears battle with Spartans moved indoors". Chicago Tribune. p. 25. ^ "Bears, Spartans to play indoors". Milwaukee Journal. Associated Press. December 16, 1932. p. 7, part 2. ^ a b c "Bears vs. Spartans". Milwaukee Journal. United Press. December 18, 1932. p. 1B. ^ "Pro gridders meet tonight in Windy City". St. Petersburg Times. Associated Press. December 18, 1932. p. 2, section 2. ^ a b Dunkley, Charles W. (December 19, 1932). "Bears beat Spartans, 9-0; win pro title". Milwaukee Sentinel. Associated Press. p. 13. ^ Williams, Marty (January 15, 1978). "Today's game not first indoors". Daily News. Bowling Green, Ohio. (Dayton Daily News). p. 12. ^ "Pro teams play indoor grid game". Milwaukee Sentinel. Associated Press. December 15, 1930. p. 2, Final. ^ Smith, Wilfrid (December 18, 1932). "Bears battle Spartans for title tonight". Chicago Tribune. p. 1, part 2. ^ "Cards Lose to Chicago Bears". St. Cloud Times. Saint Cloud, Minnesota. December 16, 1930. p. 17. ^ Willis 2010, p. 294. ^ Klein, Christopher (January 29, 2015). "The Bizarre History of the NFL's First Title Game". History.com. Retrieved January 30, 2018. ^ Kuechele, Oliver E. (December 19, 1932). "The Bears won, 9-0, but what was it all about?". Milwaukee Journal. p. 6, part 2. ^ "Bears battle for pro title". Milwaukee Sentinel. Associated Press. December 18, 1932. p. 2B. ^ a b Mayer, Larry (March 1, 2014). "Bears played NFL's first indoor game". Chicago Bears. Retrieved March 1, 2014. ^ "The Weather". Chicago Tribune. December 19, 1932. p. 1. ^ a b Smith, Wilfrid (December 19, 1932). "Bears win, 9-0; pro football champions". Chicago Tribune. p. 19. ^ Willis 2010, p. 296. ^ Willis 2010, p. 295. ^ Dent, Jim (September 8, 2004). Monster of the Midway: Bronko Nagurski, the 1943 Chicago Bears, and the Greatest Comeback Ever. Macmillan Publishers. ISBN 031230868X. ^ a b "Chicago Bears pro champions". Pittsburgh Post-Gazette. (Chicago Tribune). December 19, 1932. p. 14. ^ a b "FIRST PLAYOFF GAME". Pro Football Hall of Fame. Retrieved January 30, 2018. ^ "The 1933 Rule Book". Sports Illustrated. May 20, 2014. Retrieved January 30, 2018. ^ Willis 2010, p. 296–297. Willis, Chris (August 19, 2010). The Man Who Built the National Football League: Joe F. Carr. Scarecrow Press. ISBN 0810876701.